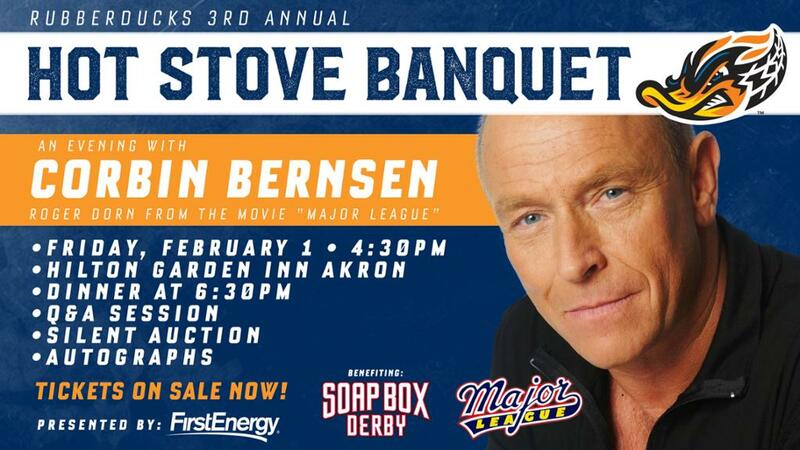 Tickets go on sale 10 a.m. Monday for the chance for fans to meet Roger Dorn from "Major League"
The Akron RubberDucks announced today Emmy-nominated actor Corbin Bernsen, who played Roger Dorn in the classic hit movie "Major League," will headline the 2019 RubberDucks Hot Stove Banquet on Fri., Feb. 1 at the Hilton Garden Inn in Akron, starting at 4:30 p.m. The Hot Stove is presented by FirstEnergy. The third annual Hot Stove Banquet will be a celebration of baseball to help get fans prepared for another exciting season from the RubberDucks and Cleveland Indians. Fans will have an opportunity to ask Bernsen about his acting career, which includes his famous role as Dorn in "Major League" and his time as Arnie Becker on the hit '80s series L.A. Law. Bernsen has couple past connections to Akron and the ball club. He made a guest appearance at Canal Park in July 2013, when he met fans and signed autographs while the team gave away Roger Dorn snow globes. In 2011, he wrote, directed, and produced the All-American Soap Box Derby-related film "25 Hill," which helped provide extra funds to the long-standing Akron institution. "Our team has created a bit of a tradition when it comes to the movie 'Major League,' having done a giveaway each of the previous six seasons while celebrating the film," said RubberDucks General Manager Jim Pfander. "It will be tough topping Hall of Famer Roberto Alomar from last year, but with 2019 marking both the 30th anniversary for the movie and the RubberDucks franchise's relocation to Northeast Ohio in 1989, we thought Corbin would be the perfect Hot Stove headliner because of his connections to the city, this team, and the movie." The doors open at 4:30 p.m. with cocktails and silent auction, which will feature autographed items from current Indians and RubberDucks, as well as some unique items donated by corporate partners and other teams across baseball. Starting at 6:30 p.m., a full-plated meal and dessert will be served (vegetarian option available), and the program and question-and-answer session will follow dinner. All attendees are guaranteed to receive Bernsen's autograph, and they will have the opportunity to meet him after the program's conclusion. The Hot Stove Banquet is open to the public and tickets may be purchased for $100 per person or $750 for a table, fans can call (330) 253-5151 or visit akronrubberducks.com. Space is limited. Tickets go on sale at 10 a.m. on Monday, Nov. 26. Bernsen most recently has starred as Henry Spencer on the USA Network's hit original series Psych. He was first catapulted to stardom during the 1980s by the hit NBC TV series, L.A. Law, earning nominations for both Emmy and Golden Globe awards for his performance as Arnie Becker. He played Roger Dorn in the "Major League" film series and starred in the movie "Hello Again." He has several directing credits, including "Carpool Guy" and All-American Soap Box Derby film, "25 Hill." He lives in Los Angeles and is from North Hollywood. Bernsen is a graduate of UCLA where he earned a bachelor's degree in Theater and a master's degree in Playwriting. Who: Emmy-nominated actor Corbin Bernsen, aka Roger Dorn from "Major League"
The Akron RubberDucks are the Double-A affiliate of the Cleveland Indians. The 2019 season, powered by FirstEnergy, will be the franchise's 23rd since moving to Akron and its sixth since becoming the RubberDucks. The 2019 Home Opener is on Thursday, April 4, at 6:35 p.m. vs. Altoona Curve.